Going on a trip? Don’t leave yourself in an airplane food lurch. Pack your own. You’re already packing clothes, it’s not that hard to pack yourself something good to eat on that plane. You’ll have to plan a little in advance (and cook) but how hard is that? And the leftovers you leave in the fridge for your family will make them miss you that much more. There’s an amazing little shop near me called BKLYN Larder. If you’re in the neighborhood, go there and take your food winnings to Prospect Park for a lovely picnic. They have the World’s Best Travel Sandwich…Ham & Gruyere with Spicy Pickles. It’s life changing (so good, so durable, and so crave worthy). We’re going to make our own version for our fictional airplane ride. 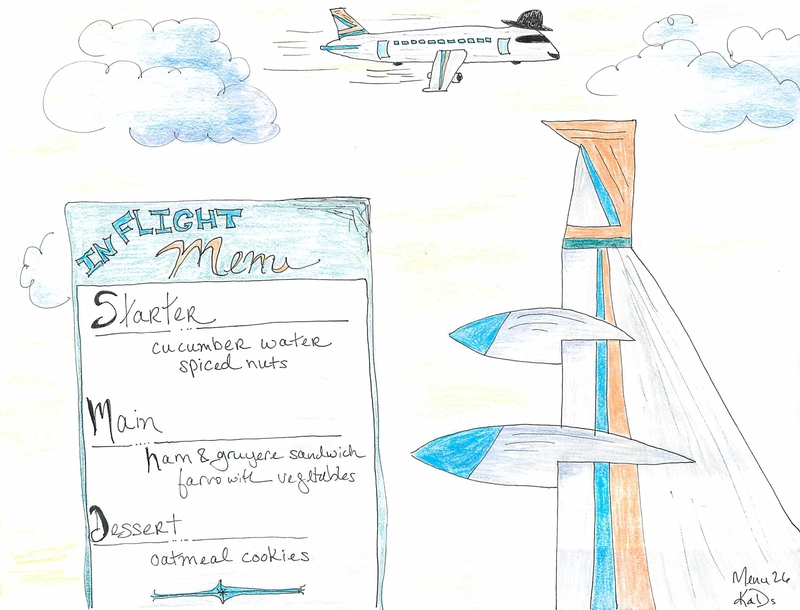 Taking food on a plane is tricky – shouldn’t be smelly. There’s a chance the gruyere and aioli here might be a tad strong, but you’re not using much of it, so take the chance. It’s not like you’re taking egg salad on the plane (total travel foul). What’s our menu? Treat yourself right and start with spiced nuts. You can buy them or make a batch yourself. They keep nicely and are a good way to pretend you’re in First Class. Bring some sliced cucumbers and add them to your iced water and you’ll feel downright spa-like. Next, the perfect sandwich. A little garlic aioli…not too much, a toasted hard roll, a few slices of shaved gruyere and the best ham you can find (sliced thin) and this is critical – a few slices of McClure’s spicy pickles. A good grain salad is a nice accompaniment – try Farro with Swiss Chard and Radicchio (grab a fork at a behind security deli). And to finish, bake yourself a batch of oatmeal cookies and take one (or two) on the trip. Have a nice flight! Remember to take some sliced cucumber. It makes your water that much better. The Sandwich: Inspired by BKLYN Larder: get the best ham you can find and have it thinly sliced. A hard roll – nothing mushy. A baguette would do. Good gruyere, also sliced thinly. Slice the roll, spread with a little aioli on one side (recipe here) and a little butter on the other side; layer your ham, then gruyere and a few thin slices of these pickles. Top on, press, wrap. Posted on January 21, 2016 by Kylie SachsPosted in travel foodTagged airplane food, airplane menu, menus, sandwich. Previous Previous post: Menu 25 – Almost A Week of Homemade Dinners! Next Next post: Menu 27 – Ladies’ Night! Nice plane!!!!! I am sooo hungry right now——sounds just right—as Goldilocks would say!!! !